There are many books about the south west of England, our beautiful Wessex. Or by local authors about other subjects. Here we will review the best. Scroll down for further intriguing books. That really is the only word to describe this interesting and highly original book from Glen Herbert. The genre is given as travel writing but it is so much more than that. It would equally appeal to history buffs, lovers of Dorset and the American continent, plus the general reader. Would make a good present. The title was coined by an aquaintance he met on his travels who asked where he came from and quipped - A Limey from Lyme. A Limey was originally a disparaging name for British sailors in America who used lime juice to prevent scurvy. Now often used just as a nickname for English folk. Glen Herbert, a boatman from Dorset, describes his travels as a backpacker in the Americas and the strife he manages to get himself into and the ingenuity, stamina and resourcefulness to get himself out again. The reader is transported into a world where sleeping in the open and lack of cash are normal, where lifts across long distances bring new aquaintances that in some cases become life long friends. He travels widely through the southern states of America and Mexico. During those intriguing travels Glen Herbert realises the close connection between the southern states of America and his adopted home town, that Pearl of Dorset, Lyme Regis. Dorset is an enchanting county with its World Heritage site, the Jurassic coast in the south and its lovely rural countryside in the north. 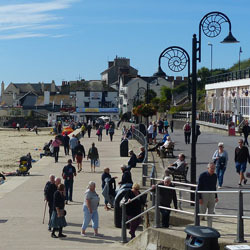 Lyme Regis, a beautiful and ancient town, is situated at the end of the Jurassic coast on the Dorset/Devon border. The Regis comes from its Charter given in 1284 by Edward I. That Glen Herbert loves Lyme Regis is obvious, but he gets mad with it too. I read this book on a cruise round the north of Australia. Sitting on the deck in the shade watching the calm, navy blue sea, I wondered what it would have been like sailing across the stormy Atlantic in those small sailing ships. Very crowded and scary for those immigrants from the south west of England. We are often only told of the leaders of these emigrations, but many of them just ordinary folk, Dorset in many cases, looking for a new life. It was difficult to put the book down at times! The author's descriptions of his travels had me wondering how he was going to get out of the latest of his scrapes. Good read. As I read I was beguiled again by hilly Lyme Regis, its Cobb and lovely beach, its bay, its fossils, and by walking on the South West Path with its incredible views. I was right there. Well worth a visit, makes a great holiday destination. A captivating read. Many folk feel the need to leave the British winter behind and find warmth in the sun. Some decide to make a sunny clime their home. Others love the idea of restoring an old property on the Continent. Two countries? Not many folk!! Maybe the book title should be “Your Country or Mine”!! 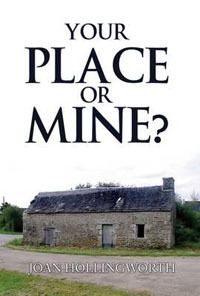 Joan Hollingsworth's very readable book “Your Place or Mine” illustrates the progress of her own and her close friend, Pat's, search for property dreams for themselves, but not totally shared ones. Joan chooses a sunny clime, an apartment in Cyprus. Pat, a talented DIY enthusiast, chooses a restoration property in France. 2000 miles apart! Two totally different lifestyles!! Brittany made sense for Pat with his family in Devon. For Joan, as for many others, she could manage her business from anywhere via her laptop, given she had an employee on the ground. Ever put a portaloo in the back of a Mercedes? Or transferred some materials from Devon to France via the ferry only to find they are the wrong size? Most DIY enthusiasts will empathise with Pat and all the problems, pleasures and achievements of restoring a neglected building. Rebuilding the roof, chimneys, fireplaces, staircases, etc etc takes time and skill that Pat has in abundance. Done in another country brings unexpected problems. Over about three years Joan describes their journey to their new lives, new friendships, new ideas. A totally new social life in two countries. Life in the sun in a modern apartment contrasting with the life in a small place in France. Not all fun, there is the heartache with loved members of one's family being so far away, particularly for Joan. For those of us who also have at some time or another changed countries will understand the heartache. There are some useful bits of information in this book about the differences in residency, medical, real estate purchase, planning permissions, and other such minefields contrasting Britain, France and Cyprus that make this book an intriguing, pleasant and even a fascinating read for anyone contemplating such moves for themselves. The author was born in Yorkshire, but her family relocated to Poole in Dorset. Joan was educated at York and Plymouth Universities. She runs a letting and property management business near Exeter in Devon. Innocence in the midst of war. World War Two was a catastrophic period in the lives of the children of occupied Europe where terrible conditions existed for the ordinary civilian population. There was starvation, bombing, the Gestapo, males of the family taken away to work in factories etc under a harsh regime from which most did not come back. Families were wrenched apart and members lost in countless ways. The Resistance by that ordinary population was heroic – dangerous in the extreme if they were caught, not just for themselves, but for their own families and for others involved, as well as the people they tried to help. Neighbours could just disappear, never to be heard of again, their fate unknown but guessed and certainly not pleasant. In the book Meintje’s mother was part of that incredible patriotic band of resistance workers. 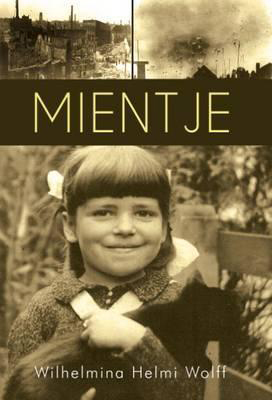 Meintje was four years old in 1939 when the war began living in Holland. Meintje is the author, Wilhelmina (Helmi) Wolff, as that little child, in a book that is sort of fiction based on real facts. The book relives her memories as a child saw things. Enchanting and innocent, but horrific as one realises the import of the background to incidents. The youngest of seven children Meintje was sheltered and loved by her family. Her father and eldest brother, Rein, were forcibly taken from them by the Gestapo to work as slave labour in Germany. This left her heroic mother to feed her family in any way she could like so many others. She grew food and made clothes from anything she had. Older children helped as they could, some worked away and brought food home. So many families faced the same grim fate. We see a child throughout the war, the adults and children around her, lucky escapes, the bombing, the starvation, the background of the resistance and the quiet heroism of her mother right through to the wonderful liberation of Europe, all told from the memories of innocent childhood. In this environment we watch a handicapped Meintje as she grows, her family, her neighbours, her childhood friends and her games. She is bullied by older children for her handicap. Misses her Papa and brother, she knows that they are somewhere scary and cannot come back yet. She is only a small child and does not realise the gist of what is going on around her. Memory for children can be heightened by the stress of events around them even if they do not understand and for this the world is lucky to have this endearing and historic book. Wilhelmina Wolf lives in Somerset these days, She told her stories to the children of her own family over the years and they encouraged her to publish them. 'Meintje’s' own children were right! This book will appeal to most people, particularly parents and teachers and all those who love and work with children. Poignant and charming, it will appeal to family historians as well as the social historians of World War Two and many others. It will appeal certainly to those folk who were children of World War II wherever they lived at the time. Or perhaps you might like to browse some more, please do, there are navigation buttons above on the left. If you are a mobile fan they are on the page that follows.